First, you can choose whether to apply grid lines and which one to be displayed(horizontal,vertical or both) and also choose their color. Both (by default): Both horizontal and vertical grid lines are visible. Horizontal: Only the horizontal grid lines are visible. Vertical: Only the vertical grid lines are visible. None: No grid lines are visible. GridLinesBrush: Gets or sets the Brush value that defines the appearance of grid's horizontal lines. 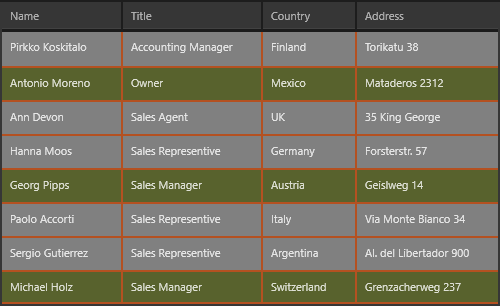 AlternationStep (type of int) - Gets or sets the step between each two alternate rows. The Modulus (%) operand is applied over this value. AlternationStartIndex (type of int) - Gets or sets the zero-based index of the row which is considered as alternation start. Here's an example displaying both the gridlines and decorating alternating rows starting from the first index with a step of 3.